The St. Mary’s Island Residents Association Ltd. (SMIRA) is run by unpaid volunteers who work, on behalf of the residents, with various agencies and entities which have an influence on life on the Island. These include Chatham Maritime Trust, the Homes and Communities Agency (HCA) who took over from SEEDA and who own the undeveloped land, Countryside Maritime Limited (CML) (the developers), Medway Council, Barratt Homes, Redrow and Moat Housing. Effective 11th January 2018 the HCA is now known as Homes England. SMIRA have a website, www.smira.info, where information and news is posted including the minutes of SMIRA meetings. Recently, it has been used to consult with residents on the Traffic Regulation Orders that will be imposed following the ring road adoption (see below). 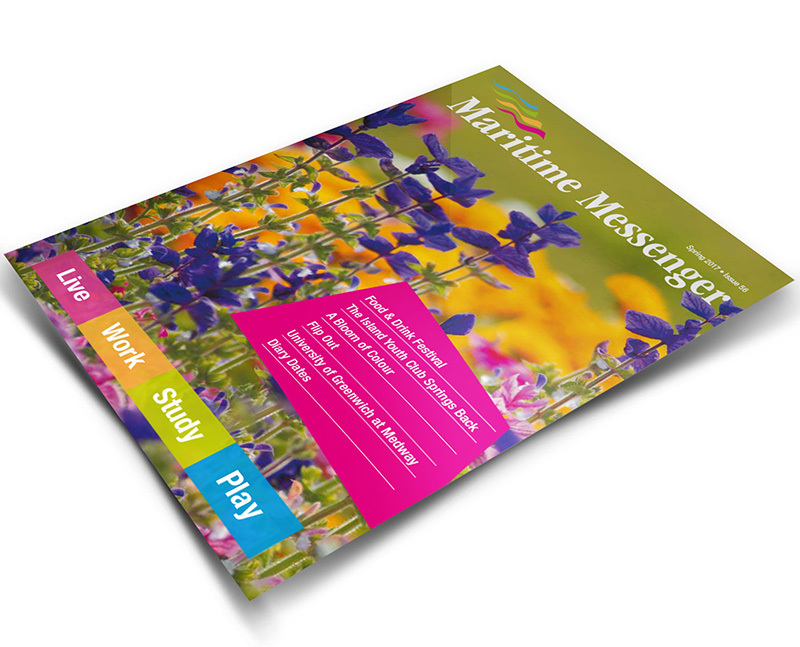 SMIRA produce a yearly newsletter which is distributed to all households on the island, whether they are members or not. SMIRA’s membership covers over 700 homes and this strengthens their effectiveness when dealing with outside agencies in order to get our views across. Note: effective 25th March 2018 SMIRA’s twitter account @SMIResAssn is no longer operable. Driven the adoption of the Island roads with Medway Council. It is anticipated that all sector roads will be adopted by the end of 2018 and those in the ‘build-out’, one year after each sector is completed. Pressed for the provision of two zebra crossings to provide a safe access to the Community Centre, Doctor’s Surgery and Pharmacy and one to serve the elderly assisted living dwellings which should be completed in 2018. The crossings will be funded by Countryside and constructed during the school summer holidays. 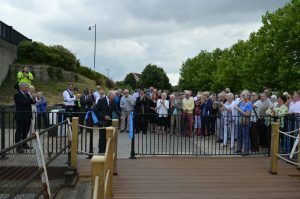 SMIRA worked with Chatham Maritime Trust and Medway Council to get the walkway between Basin 1 and Basin 2 re-opened; this was officially opened in August 2016. SMIRA seek to resolve any issues that arise from Chatham Docks, e.g. mitigate noise and dust pollution. Represented residents and challenged Peel Ports on the ‘wood chip’ nuisance issue; facility eventually shut down. Maintains a good relationship and ongoing dialogue with the Environment Agency to ensure that no commercial operation in Chatham Docks adversely affects the lives of residents. Working with the marina and other agencies to get the marina cleared up. Chatham Maritime Trust has fixed new mesh panels to the lower section of the perimeter railings alongside the marina to prevent rubbish being blown in. SMIRA representatives attend regular meetings with other stakeholders in an effort to improve the quality of life for Island residents. Residents are kept informed about what is going on across the Estate via their website, the SMIRA meetings, the annual newsletter and Facebook Page. Supporting Chatham Maritime Trust with enforcement of covenants. Founded and sustained St. Mary’s Island Youth Club – ‘Castaways’. Youth Leader funded by Chatham Maritime Trust. Established an official SMIRA Facebook (‘St. Mary’s Island Residents Association Official Group’) page to act as a conduit for factual information to registered residents. It is also a channel for residents to ask questions and seek advice on matters related to living on St. Mary’s Island. Negotiated with the School for the rear pedestrian access path. This was paid for, resurfaced and continues to be maintained by Chatham Maritime Trust. Pressed Medway Council for the car parking consultation due to the car parking issues in certain areas on St. Mary’s Island which will only increase with the build-out of the Island, the opening of the assisted living accommodation and the expansion of the school. Represented residents’ interests at preliminary meetings with DMC Health at the Doctor’s Surgery and provided feedback prior to the formation of a patients Participation Group (PPG). 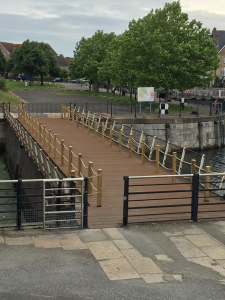 After a period of three years the access under the HMS Chatham Bridge over the caisson between Basins 1 and 2 is now open again. Those residents that used the access to the Co-Op and Dockside Outlet Centre previously will know that it provides a much safer route away from the main road, particularly for children and older residents. This is yet another example of SMIRA, who has been working alongside Chatham Maritime Trust on this over a long period, looking after the best interests of residents to ensure that our lovely Island is sustainable and a pleasant place to reside. The then Chair of SMIRA, David Taylor, expressed particular thanks to Chatham Maritime Trust who headed up the protracted negotiations with Peel Ports to secure a licence that made this possible and went on to finance the construction of the new walkway and it’s ongoing maintenance. If you are a Moat tenant and have any queries or questions then please call 0300 323 0011 or 0845 359 6218 . Every six weeks SMIRA holds a meeting at the Community Centre which is open to all. At these meetings issues concerning the residents of the Island are discussed with other interested parties who include representatives from Chatham Maritime Trust and local councillors. It gives residents the opportunity to raise issues and ask questions of those people who influence life on the island. Membership of SMIRA does not mean you have to attend these meetings (we wouldnt have the room to accommodate everyone) but anyone is welcome to attend. Any resident is welcome to attend these meetings without prior notice. Meetings commence at 7 pm at St. Mary’s Island Community Centre. The minutes of the SMIRA meetings are published on the SMIRA website. The 2017 AGM was held on 1st December 2017 at 7.30 pm in the Community Centre at which there were a number of guest speakers. Following the SMIRA meeting on the 27th June 2017 SMIRA launched it’s official Facebook Group; 27 applicants and counting… Residents can apply to join via their own facebook page. * Update from SMIRA. Following the Residents’ Open Meeting held on the 26th February regarding the introduction of a proposed controlled parking scheme, Allan Sneller and David Taylor from SMIRA have had a follow-up meeting with Medway Council. They had by then had the opportunity to take on board the points raised by residents at the open meeting and also, as requested, had a meeting with St. Mary’s Island School. Allan Sneller and David Taylor have been in regular contact with those dealing with the parking permit and Surgery issues to provide residents with a statement which will be read out at the meeting on Tuesday 20th March. As these issues are understandably of great interest and important to residents, SMIRA are concerned that the attendance will vastly exceed the capacity of the Community Centre Meeting Room and for that reason have decided to place the updates on social media as and when they are received. At the meeting on the 20th March the updates will be read out for the benefit of those who do not access social media. Debate will be limited as no more detailed information is available at this stage. when the ‘formal’ public consultation commences drawings will be uploaded to the Council website so all can view. The website will also contain a document answering frequently asked questions and giving responses to the questions received to-date. the period for the ‘formal’ public consultation will be 21 days. all residents will receive a letter stating when the ‘formal’ public consultation period will commence and details of the website. This ‘formal’ consultation will be the period in which residents have an opportunity to comment with support as well as any objections on the proposals put forward. following the ‘formal’ public consultation, all results will be analysed. once a decision is taken all residents will be informed of the next steps in the process. If a scheme is installed the scheme will be regularly monitored. • Annual resident permits cost £30.00 per permit and can be purchased by those residents that own vehicles that are registered with the DVLA at their address on the island. • Visitor permits cost £2 per day and can be purchased by SMI residents. An updated statement regarding the Surgery is awaited and this will be put out by SMIRA on social media as soon as it is received. Further to my letter dated April 2018 (as above) due to budgetary constraints in 2018/19, the Council has decided to suspend all further work on consultation for a controlled parking zone (CPZ). Consultation and any resultant implementation would require a substantial investment by the Council. Added to this the complexities of implementing a scheme where some roads are unadopted makes the progression of this scheme unviable. It has therefore been removed from the programme until further notice. I appreciate this will be disappointing news for those residents who highlighted and supported the need for parking restrictions. This decision will not preclude reviewing specific areas that are experiencing difficulties on the Island and which may benefit from restricting parking at certain times, i.e. placement of single or double yellow lines as appropriate. Please note no further communications will be issued on this subject and no further requests for resident permit parking schemes will be considered in the foreseeable future. The final meeting of the year, the AGM, will be held on Friday 7th December at 7.30 pm. This is open to all residents but only members will be entitled to vote. Formal Notice and details will be sent to members in advance of the meeting. With the pending retirement of most of the Board at the forthcoming AGM, any candidates to be Directors should notify the Company Secretary, Bob Muid, no later than 14 days before the AGM. A Director’s Nomination Form must be completed (this can be found on SMIRA’s website) and two members of SMIRA must nominate the candidate on the same form. The signed form can then be submitted by email to admin@smira.info or posted to the Company address: St. Mary’s Island Residents Association, The Observatory, Brunel, Dock Road, Chatham Maritime, ME4 4AF to arrive before Friday 23rd November. In accordance with SMIRA’s Articles of Association, once nominations are closed, thirteen days before the AGM, SMIRA will send out to all their Members the particulars of all the potential Directors. These include full name, address and occupation. Following the AGM the Company Secretary will inform Companies House of the resignations of the current Board and the appointment of new Directors. Once the new Board is in situ and they have elected a Company Secretary, Companies House will be informed of the change of Secretary. SMIRA requires two Directors and a named Company Secretary . The responsibilities of the various roles – Chair, Vice Chair, Directors and Hon. Treasurer are detailed on SMIRA’s website. All Directors , including the Chair and Vice Chair, have a legal responsibility (SMIRA is a limited company) to ensure that the Statement and Annual Accounts are filed at Companies House by the due dates. Failure to do so could result in a fine. The two new SMIRA Directors elected and nominated to the Chatham Maritime Trust Board are Mandy Samrai and Yvonne Bishop and they will be representing the residents’ interests. Details about the new SMIRA Directors can be found on SMIRA’s website. Saturday 16th March from 10 am to 11.30 am – an informal drop-in session at Starbucks (Dockside). Not all residents like to engage in a formal setting so this is an opportunity for those residents who may wish to have an informal chat. Anyone owning a house or flat on the Island is entitled to become a member. A SMIRA Membership Application Form is included with your house purchase documentation. They can also be obtained from the CMT Office. Application forms can be sent to SMIRAs registered office which is at the Trust Office (The Observatory, Brunel, Dock Road, Chatham Maritime, Kent ME4 4AF). They will be forwarded to SMIRAs Membership Secretary. Membership of SMIRA is free to qualifying residents. However, if you would like to support SMIRA, a cheque for £10.00 made out to SMIRA would help cover administrative costs for your application and would be appreciated. SMIRA can be contacted direct by email on admin@smira.info. Their website address is www.smira.info. SMIRA has the right to nominate two Trustees to the CMT Board. For details of current nominees, see Members & Trustees.